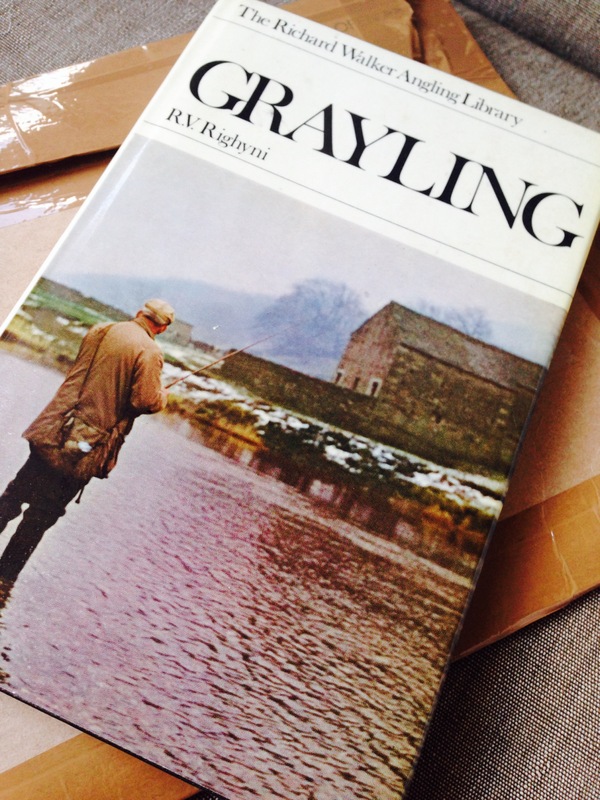 Struggling to peel back the brown packing tape I was eager to open the brown card envelope to reveal the copy of Grayling by R.V.Righyni published in 1968 as part of The Richard Walker Angling Library. I have been trying to get a copy if this book for several months, not saying there are none around but at a sensible price. Rare and hard to find angling books command high prices and many form collection or have been purchased by dealers. There are a few copies for around £25 but many are now £75 or more. I wanted to read up on these pewter coloured fish as young Tales had become obsessed with catching one. Before he left for school today I was instructed to call the Lower Itchen and the Timsbury Fishery and see if I could book us in for the coming weekend. For a ticket will set us back between £20-40 per rod so I have decided to act as the net carrier. What is good about the arrival of the book from the Paxton Toll House is that it will form part of young Tales reading for the week, having signed his reading record usually for Match, Beano or titles by Paver, Pichon. Kinney or Morpurgo, I know this should hold his interest if for no other reason than to profess he knows more about fish and fishing than I do. Well it might be a case that we’ll fight over this title this week. Well, before he gets home I’ll get on the phone to the fisheries and hopefully book us in. Young Tales will also be able to use his new second-hand Flyweight reel we purchased the other week so that he has a fully balanced outfit pairing his lightweight Sportfish rod to a reel spooled to the correct weight line, which will be a first. All of last season we compromised by using a slightly heavier line than the rod was rated for. Well I hope the learning from the reading results in tight lines.